Welcome to the Team Card & the Dirty Little Secret of Joining! 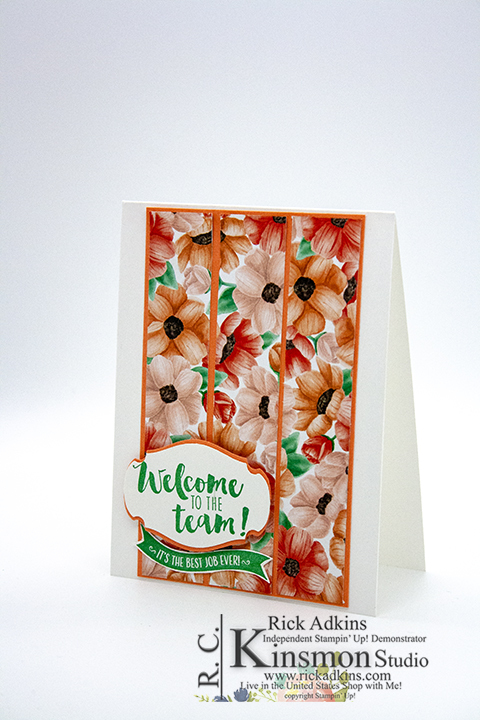 Hello and welcome to my blog; today I am going to share with you the card that I made to send out to new team members. Or family member is how I like to refer to them. This is a very quick and easy card to do and you could totally change it sentiment and have a totally new card with this simple design. Here's a look at my cards for my new team members. This is a super easy design to do and a great way to use up that designer series paper. Here I picked the Painted Seasons Designer Series Paper (I am like in love with this paper) to showcase. I used the Stamping Your Way to the Top Stamp Set that was designed for demonstrators. And, was perfect for cards to welcome new family members in. 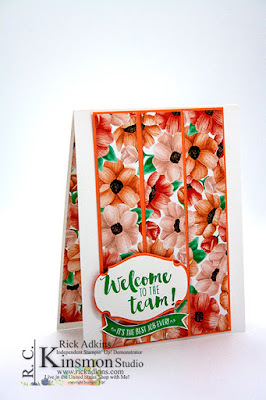 Now is the perfect time to join the Stampin' Up! family. Think of becoming a demonstrator as buying a membership to Costco or Sam's Club, with one big exception you actually get something for your membership fee besides a god awful membership card with a worse picture than your driver licences. Especially with eight days of Saleabration left. That means there's only eight days to take advantage of the best sign up special ever. For the next eight days you have two options of membership. Option one is a $175 worth of Stampin' Up! product of your choice for only $99. Option two is $175 worth of product and this fabulous tote bag (a $50 value) for $129. 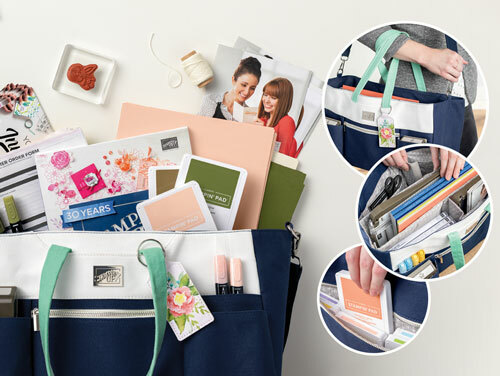 Not only do you get that with your membership but for every order you place after signing up and joining my stampin' family you get at least a 20% discount on all orders. Now who doesn't love a deal like that, and it doesn't even stop there. There's so much more to being part of the family, than just the discount. When you become a demonstrator you get to attend special Stampin' Up! events, a quarterly magazine filled with business tips, and card ideas, just to name a few. 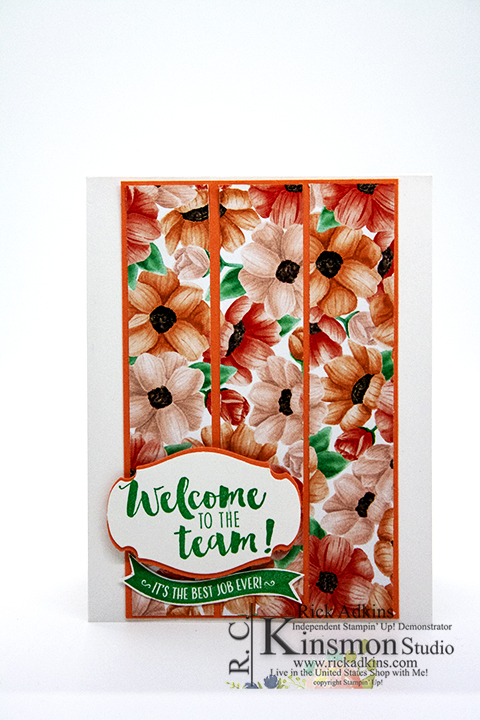 I haven't even mentioned that you get to become a part of my super wonderful stampin' family the Kinsmon Crafters. You can read more about the benefits here. You can also find information to and answers to the most frequently asked questions right here. I would love to have you join my Stampin' Family and become a Kinsmon Crafter. I have a small team that are all around the country. I have monthly meetings online in our private Facebook Group. And you will get one of these cards in the mail too. I totally would take advantage of this wonderful joining special will be join in eight short days. Thanks for dropping bye I look forward to you joining my little family of creatives.